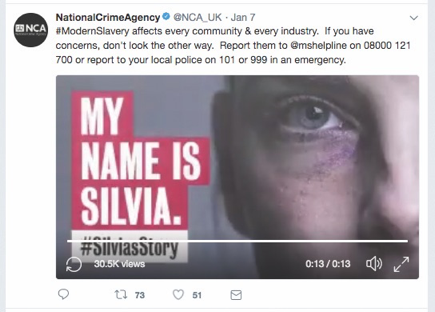 The National Crime Agency asked us to create a series of seven campaigns to raise awareness of modern slavery and human trafficking. Each one had to feel like a punch in the gut. We had to make people stop and take notice. First, we used Twitter to create and publish a fictional day in the life of ‘Silvia’, a slave working in a brothel. By telling ‘Silvia’s story’ in real time, we were able to build a picture of her life that felt personal and true. We produced a video about slavery at sea in the UK. We consulted Human Rights at Sea and other organisations to get the messaging right. The video adopted the on-trend ‘recipe’ format where the condition of fish provided a useful and harrowing metaphor. We also produced a series of social media assets, including gifs and imagery to accompany the video. Another campaign looked at child trafficking. Through Instagram, we told the fictional story of a girl who comes to the UK and gets exploited. The tone changes as the reality of the girl’s situation becomes clear. 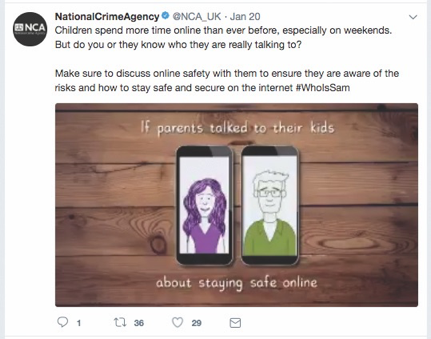 Our social content for the NCA has received national press coverage. Our animations were used on both BBC and ITV news items.